No, I haven’t dropped off the face of the Earth, although the last month or so has made me want to. There simply doesn’t seem to be enough time in the day to do everything I need to do. Between work — and I’m not really complaining. I’m thrilled with how Naked Reader Press has done this first year of operation — the family and trying to write, sleep has become an almost forgotten commodity. Even when I do sleep, my mind is racing, trying to accomplish everything I didn’t get done during the day. Unfortunately, I don’t have a way to interface the mind with the computer. The last year hasn’t seen as much writing as I’d like but after taking a couple of weeks off last month, the muse has gotten very loud and demanding. I have a deadline in two weeks that I’m working furiously to complete. 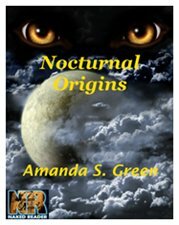 After that I have to put the finishing touches on Nocturnal Serenade, the sequel to Nocturnal Origins. Then there’s another project to do as well as proposals to send out and, well, you get the idea. But I am really excited about a project I can’t say much about just yet. Just know that I’m doing the happy dance in the corner and will be shouting the news from the rooftops as soon as all the i’s are dotted and the t’s crossed. Hopefully, it won’t be long. In the meantime, I have to try to find a way to quiet the muse about the space opera, the mystery and the I-don’t-know-what-it-is-and-don’t-want-to projects it wants me to do NOW. Maybe if I make a few notes about the different plots, it will leave me alone…yeah, I know. Wishful thinking. The word count yesterday wasn’t spectacular, but today looks like it will be better. The problem is that even inside it is too hot to work. It hasn’t been this bad down here since 1980. I do not want to see my next electric bill. Any way, time to get back to writing. I promise to be back later this week, assuming my brain hasn’t fried like an egg on the hot sidewalk.